Sweetened condensed milk is used for everything from making key lime pie to giving your coffee a sweet, creamy boost. It's basically a sweet, concentrated form of milk -- think sugary, syrupy milk. The problem is, the carbohydrates from the sugar make it a no-go for dieters following a low-carbohydrate meal plan. But don't worry, it's easy to find a substitute for sweetened condensed milk, whether for your recipes or just pouring it on top of, well, anything. The world of concentrated milk is often confusing, especially when you're trying to figure out the difference between one type versus the other. Evaporated milk often serves as the go-to substitute for sweetened condensed milk when a less-sweet version is needed. Both sweetened condensed and evaporated varieties are made from fresh milk; water is removed from the milk to make it concentrated. The main difference between the two is that condensed milk has sugar added to it after undergoing the vacuum process. For a replacement for sweetened condensed milk, grab a can of evaporated milk, add a low-carb sweetener, and you're all set. If you haven't heard of it, table cream is unsweetened light cream that has the consistency of sweetened condensed milk. You'll find it in the same aisle as heavy cream. The benefit is that because it's unsweetened, it contains very few carbohydrates. It's commonly used in Latin American dishes, but works just as well as a substitute for sweetened condensed milk in desserts and baked goods. A serving of 1 tablespoon contains 1 gram of carbs. You have the freedom to sweeten it with your favorite low-carb, or zero-carb sweetener, such as Stevia. If you have the time, make a batch of homemade sweetened condensed milk. This allows you to use the low-carb sweetener of your choice. Use low heat to essentially concentrate the milk -- so this isn't an option if you're in a rush. 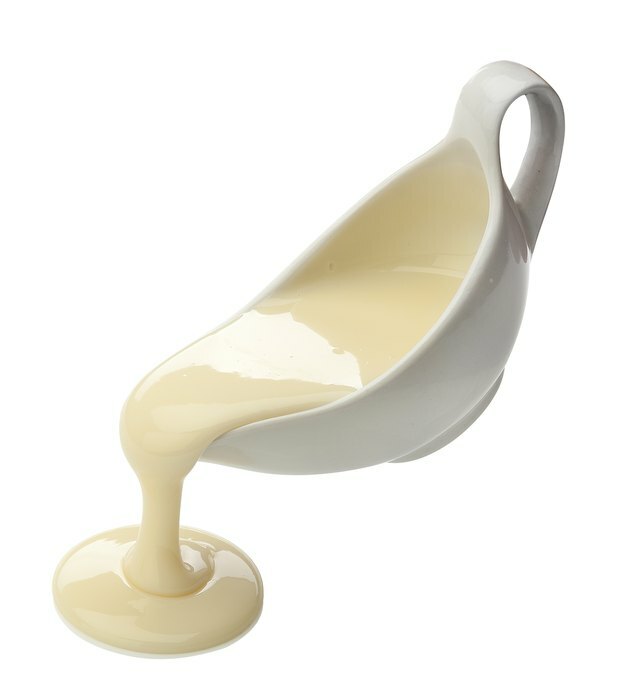 To make your own sweetened condensed milk, combine whole milk and butter in a saucepan with a heavy bottom. If you've chosen a heat-stable, low-carb sweetener, it can go in together with the milk and butter. Stevia, for example, is heat stable up to 392 degrees F, so it's a good option. If you're unsure whether your sweetener is heat stable, add it last. Depending on the recipe, you may want to add some vanilla. Lower the heat, and simmer for about two hours to evaporate some of the liquid so you're left with a concentrated, syrupy milk. You'll have your very own batch of low-carb sweetened condensed milk. If you lack the two hours or so that it takes to make homemade sweetened condensed milk, make a substitute using heavy whipping cream. As with other replacements, it's made of fresh milk and can be used for pies, soups and homemade ice creams. One-half cup of heavy whipping cream contains about 3 grams of carbs, and a 1-teaspoon serving contains less than half a gram. To make a sweetened condensed milk substitute, combine 2 cups of heavy whipping cream with about five eggs in a saucepan over low heat, and whisk until it thickens. Add your sweetener at the end if it's not heat stable. This will make a nice batch of almost 2 pints. What Dessert Can You Have on a Low-Carb Diet?